Latinos make up almost 90 percent of enrollment in L.A. Unified’s Board District 5, which has some of the district’s neediest students and the state’s lowest-performing schools. But they most likely won’t be the ones electing their next representative to the school board. Tuesday’s special election for the vacant school board seat comes on the heels of a January teacher strike that drew national attention to the country’s second-largest school district. Despite that, it’s expected to draw “minuscule” voter turnout, and experts predict Latino participation will be even lower, particularly in the board district’s poorer southeast section, where Latinos make up almost the entire enrollment and where the most struggling schools are located. Regardless of the urgency of improving educational outcomes for students living in the southeast communities, most likely it will be the district’s northeast voters — whiter, wealthier, and older, and many without children in public school — who will turn out in greater numbers and determine the election’s outcome, say political scientists, pollsters, and community activists. If none of the 10 candidates wins more than 50 percent in Tuesday’s primary, a runoff will be held May 14. Some experts don’t even think a Latino candidate will make it to a runoff. And that is raising the question among Latino leaders of whether an expensive special election is the best way to get someone who truly represents the majority. “It’s a waste of money. It’s an undemocratic election. We talk about voter suppression in the southeast. By holding a special election in the manner that they are doing this, it disenfranchises communities, especially the southeast community,” said Fernando Guerra, a professor and founding director of the Thomas and Dorothy Leavey Center for the Study of Los Angeles at Loyola Marymount University, which conducts the L.A. Votes exit poll. The two halves of District 5 are far away from each other in distance and educational opportunities. On a map, BD5, as it’s known, looks like a backward letter C. Northeast of downtown, about 32,000 students are enrolled in schools in whiter, more affluent neighborhoods such as Eagle Rock, Los Feliz, and Silver Lake — where voter turnout has traditionally been higher. Latino students, however, are still the majority in BD5’s northeast section, making up 74 percent of enrollment. Latino experts and political watchers agree that those who will be most impacted by low electoral turnout will be the 67,000 students in the southeast section, which includes Huntington Park, Maywood, Cudahy, and South Gate, with an overwhelmingly Latino and low-income population. There are seven schools in BD5 that were recently identified as being in the bottom 5 percent of schools in the state, and all seven are in the district’s southeast section, according to the district. Of the 39 schools rated in the lowest categories on the California School Dashboard, 64 percent are in the southeast. Roughly mirroring L.A. Unified as a whole, more than a quarter of BD5’s students are classified as English learners and 11 percent require special education services. More than 85 percent live in low-income households, and an estimated 2,000 students are homeless. Nearly 4 in 10 of the district’s elementary and middle schools are in the lowest categories in both math and reading on the state’s dashboard. However, BD5 topped L.A. Unified as a whole last year with its graduation rate of 83 percent, compared with 76.6 percent for all traditional schools in L.A. Unified. In BD5, 64 percent of high school graduates were eligible for the state’s public universities, compared with 49.9 percent for L.A. Unified. (The data do not include independent charter schools.) One reason for the higher graduation rates could be that there are a number of community organizations and Latino advocacy groups that partner with high schools in BD5 to help students graduate and go on to college. Last week, three schools in BD5 were recognized by the state as California Distinguished Schools, out of 17 district and charter schools in L.A. Unified. Two are in the southeast: Linda Esperanza Marquez High LIBRA Academy, a district school, and Alliance Marc & Eva Stern Math and Science High School, an independent charter school. Renaissance Arts Academy, also an independent charter school, is in the northeast. Turnout is expected to be far lower because this is a special election and it’s the only major race on the ballot apart from a few municipal elections. In 2015, “there were four board races at the same time, so there was a greater discussion about the election in L.A.,” Guerra said. The BD5 special election was approved by the school board in August, a month after board president Ref Rodríguez resigned after pleading guilty to political money laundering charges. The seat has been vacant since then. The winning candidate will serve out Rodríguez’s term, which ends in December 2020. When Rodríguez, a Latino, won the seat in 2015, only about 7 percent of voters cast ballots in the school board primary, Paul Goodwin, a local pollster, wrote in an email to LA School Report. The turnout — a little over 26,000 people — was comparable in the runoff election, he said. Guerra said Latinos represented 55 percent of those who voted in BD5 in the 2015 primary and runoff elections. “But let’s keep in mind that they [Latinos] represent 85 percent of the population,” he said. Jaime Regalado, a political science professor at California State University, Los Angeles, said he can see how the communities of the southeast may feel left out in the election process. Former District 5 board member Yolie Flores said in a phone interview that the Latino candidates from the southeast on the ballot should focus on getting the vote out. “I encourage the candidates of the southeast to focus on voter turnout, because if any of them lose, it is because people didn’t go out to vote,” she said. Flores was elected in 2007 and was vice president of the board for three years of her four-year term. Flores and Rodríguez have been the only two Latinos elected to represent BD5 in the past two dozen years. There are seven Latino candidates among the 10 names on the ballot. 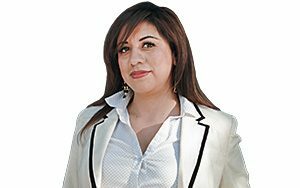 Two of them are elected officials in the southeast: Nestor Enrique Valencia is a council member in the City of Bell, and Graciela Ortíz is a councilwoman in Huntington Park. Ortíz is the only Latino among the top four candidates with the most campaign contributions so far. As of last week, she had raised $130,088, putting her fourth in terms of fundraising. Flores has said the cultural and linguistic needs in most of BD5, and particularly in the southeast, should be a critical consideration in this election. “I’m a strong believer that representation matters. My own experience, during my time at the board, I had to fight some fights on policies and strategies that some board members didn’t support because they didn’t understand the population that I served,” she said. Will a Latino advance to a runoff? Sánchez said he believes a runoff would be between two non-Latino candidates: Heather Repenning, a former director of external affairs for the City of L.A., and former BD5 board member Jackie Goldberg. Both live in the northeast area, and Repenning’s daughter attends an L.A. Unified school there. Goldberg has been a longtime resident of Silver Lake. She served on the board nearly 30 years ago and doesn’t speak Spanish. Repenning spoke Spanish at a candidate forum earlier this month. Repenning taught English as a Second Language at Los Angeles City College and taught in a bilingual school in Honduras. She lists among her endorsements the Latino Coalition of Los Angeles and Mayor Eric Garcetti, whose grandfather was born in Mexico. Goldberg has been endorsed by two prominent Latino leaders, activist Dolores Huerta and Hilda Solís, a Los Angeles County supervisor and former U.S. labor secretary who credited Goldberg with “fighting for the first living wage and ensuring support for bilingual and dual language programs.” At a candidate forum this month, Goldberg highlighted how as a school board member she helped create a districtwide Spanish Bilingual Immersion Program. Both Repenning and Goldberg have prominent labor backing. Repenning has been endorsed by SEIU Local 99, which represents education workers such as cafeteria workers, bus drivers, and teachers assistants, and Goldberg by United Teachers Los Angeles. Goodwin said a runoff between Repenning and Goldberg would likely discourage Latino turnout. “It depends on who the candidates are. If you have a Latino candidate who makes the runoff, there might be a push for Latinos to turn out,” Goodwin said. “If you have this interesting sort of inter-union battle between Heather and Jackie, where there’s unlikely to be any substantive difference between them … then you might have very, very low Latino turnout — maybe made up for by slightly higher turnout in the northern part of the district.” So in the end, total turnout in this year’s race could be similar to 2015’s turnout, but the composition of the vote could be different, he said. 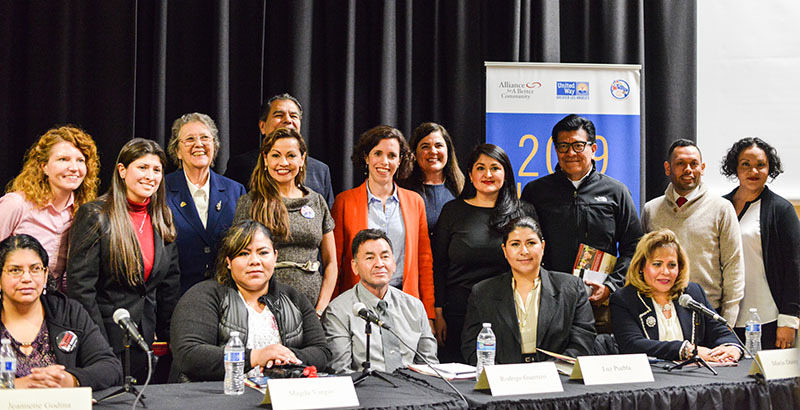 María Daisy Ortíz, an immigrant parent who was a panelist at a recent candidate forum, said she is not as concerned that BD5’s board member be Latino as she is that the person can improve educational opportunities for English learners and low-income students. “I hope all parents, particularly Latinos, can be very analytical about who they’re going to vote for and don’t vote for a candidate that only tells them what they want to hear. There’s much more at stake in this election,” said Ortíz, who is also a member of the district’s committee for English learners and a frequent speaker at L.A. Unified board meetings. Sánchez noted that there’s an even bigger issue. He said that the majority of the people who traditionally vote in school board elections don’t even have children in public schools. “Only 10 percent of people who vote have had their kids or currently have kids enrolled in the school district,” Sánchez said, based on his experience with school board races in Los Angeles, including working for Mónica García’s 2006 school board campaign. He was also a BD5 school board candidate in 2011, narrowly losing to Bennett Kayser. Kayser was defeated by Rodríguez in 2015. To make the board selection more democratic, Sánchez is advocating for youths starting at age 16 to be able to vote in school board elections, as well as non-citizens. In a school board election in November, San Francisco became the first California city to allow local non-citizen voting. At the parent-led forum in Eagle Rock this month, candidate Salvador “Chamba” Sánchez said all parents should be allowed to vote in school board elections regardless of their immigration status. Guerra said that would be “symbolically” important, but it would not solve the problem of low turnout. Guerra also said he was “strongly” in favor of an appointment by the board instead of a costly special election. This election is expected to cost $4.3 million, based on estimates from city and county election officials. At a board meeting last August, board member Scott Schmerelson proposed appointing Goldberg to the seat, which drew significant pushback from Latino parents. The board voted instead to keep the seat open until an election could be held. Flores said she would not have supported the appointment. Getting Latinos to vote or become civically engaged has been a historical challenge, not only locally but nationwide. Even politically aware parents like Ortíz may sit out Tuesday’s election and wait for a runoff. Ortíz said she was glad that she participated in the candidate forum, but she said that she didn’t feel encouraged enough to vote for any of the candidates. “I might wait until the runoff. None of them has yet fulfilled my expectations, and I don’t want to vote led by emotion. I need to make a very well-informed decision. I’m still not there yet,” she said. Flores believes southeast Latinos can make a difference in special election whether they are able to vote or not. She encouraged all parents, including immigrant parents, to make their voices heard. Taylor Swaak contributed to this report.